This product will not work in USA, Canada, Japan and other countries with 100-120V, unless you are using a step-up converter. Delonghi Eletta Cappuccino Top ECAM 45.366. 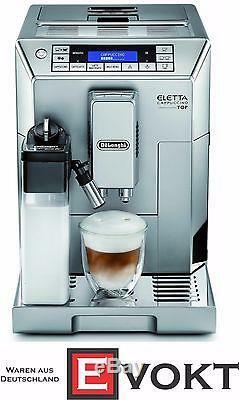 Espresso Coffee Machine GENUINE NEW. DELONGHI ELETTA CAPPUCCINO TOP ECAM 45.366. 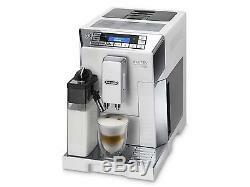 Eletta Cappuccino TOP ECAM 45.366. S Clarity, simplicity and clearly identified functions. Eletta is the harmonious marriage between design and functionality. SENSOR METAL TOUCH CONTROL PANEL. NEW LatteCrema System Enjoy a perfect mix of pleasure. A creamy cappuccino, with dense milk foam, always at the perfect temperature until the last drop. The automatic cleaning function integrated in the froth regulating knob guarantees an easy and secure cleaning of all milk frother components. MILK MENU Apart from the direct milk buttons Cappuccino, Caffelatte and Latte Macchiato discover the world of milk entering in the Milk menu where you can choose among hot milk, Flat White, Espresso Macchiato and MY MILK, which gives you the possibility to personalize your preferred milk. SENSOR METAL TOUCH CONTROL PANEL Intuitive metal touch control panel with two text lines display in 16 languages, which helps you in every circumstance to use the machine in a clear, simple and immediate way. New DeLonghi LatteCrema System: Enjoy a perfect mix of pleasure. Automatic cleaning integrated in the froth regulating dial permits you an easy cleaning of the whole milk carafe components so the milk carafe can be turned to the fridge after use. Extra cappuccino device for steam and hot water can be used to manually prepare velvety milk foam or deliver hot water for tea or infusion. Choose your favourite milk beverage in the Milk Menu: hot milk, flat white, espresso macchiato and My Milk tailor your perfect drink. Intuitive sensor metal touch control panel with two text lines display and 16 languages for using the machine in a clear and simple way. Long Coffee button for Drip coffee lovers. Personalising coffee as often as you want has never been easier. Choose from short, medium or long, try a strong or extra mild aroma, enjoy it piping hot, medium or low temperature. The machine can be used with either coffee beans or ground coffee. Prepare two cups of coffee with a single brewing cycle. Active cup warmer for cups always at the right temperature. Removable brewing unit for easy cleaning and maintenance. Programmable automatic shut-off and switch-on. Dimensions (wxdxh cm):26.0x36.0x46.0. Rated voltage/Frequency (VHz):220/24050/60,220/24050/60. Coffee grounds container (n°):14. Descaling, cleaning and rinsing program. New silent grinder with 13 setting. Removable drip tray with level indicator. Please read our terms and conditions before purchasing from us. All packages are Trackable and will require proof of signature upon receiving. Weekends and bank holidays do not apply to any of the above time frames. Please note that it is the recipient's responsibility to open and inspect the package. If there are irremediable defects with the devices, you can return them back to us for repair or replacement within 30 days. We will compare serial no. No alternative methods are allowed. Please note that our products are coming with European Sepcifications and/or with European 2 PIN plug. The item "Delonghi Eletta Cappuccino Top ECAM 45.366. S Espresso Coffee Machine GENUINE" is in sale since Tuesday, February 23, 2016. This item is in the category "Home & Garden\Kitchen, Dining & Bar\Small Kitchen Appliances\Coffee, Tea & Espresso Makers\Espresso & Cappuccino Machines". The seller is "evokt" and is located in Berlin.